What are the top countries for fish farming? Aquaculture is loosely defined as the production of hatchery fish and shellfish which can be grown to market size. They can be raised in tanks, ponds, or other natural habitats. The species that is raised can be used to stock freshwater of fish for release into the wild, or for human consumption. Aquaculture can help support commercial and recreational marine fisheries, and rebuild wild stock populations or coastal habitats such as oyster reefs. Aquaculture also includes the production of ornamental fish for the aquarium trade and plant species used in a range of food, pharmaceutical, nutritional, and biotechnology products. There are also related industries such as equipment production, feed, and nutrition companies, and aquaculture consulting service firms that provide support to the global aquaculture industry. The U.S. marine aquaculture industry is relatively small compared with world aquaculture production. Molluscan shellfish, consisting of oysters, clams, and mussels, make up most of the U.S. aquaculture production, followed by salmon and shrimp. Aquaculture has the potential to reduce the nation's dependence on imports. Right now, the United States is a major consumer of aquaculture products, importing a large percentage of our seafood, half of which originates from aquaculture. Many countries invest substantial resources into aquaculture. 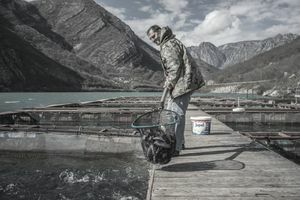 According to data from the United Nations Food and Agriculture Organization (FAO), the U.S. is not even in the top ten countries for total aquaculture production. Across every subset of aquaculture, China is by far the largest producer. According to the FAO's Fisheries and Aquaculture Department, while China's history of aquaculture dates back more than 2,000 years, it wasn't until after the 1949 founding of the People's Republic of China that production became large scale. It is one of the fastest-growing areas of agriculture for China, with farmed seafood accounting for more than half of the country's overall seafood production. Like China, Japan has an ancient tradition of aquaculture that became a prominent economic sector in the modern era. For Japan, the rise of aquaculture began in 1930 and ramped up into the 1950s and 1960s. Although the industry has been on the decline in recent years, both marine and freshwater aquaculture farms can be found in all 47 of Japan's prefectures, according to the FAO. Another country with a long history of aquaculture, India developed controlled breeding of carp in the early part of the 19th century, which until the 1950s was restricted to backyard ponds in most areas. It is not as large a producer as China, but India's aquaculture industry has grown significantly, with the production of farmed shrimp leading the way. Commercial aquaculture in Norway started in the 1970s, according to the FAO, and has become a major industry in the country's coastal areas. The Atlantic salmon is the top farmed fish in Norway, representing over 80 percent of the country's aquaculture production. Farmed rainbow trout has gained popularity in recent years as well. The aquaculture industry in Vietnam began in the early 1960s and has grown exponentially since that time. It's among the top ten producers of farm-raised crustaceans. What Are the Environmental Benefits of Aquaculture (or Fish Farming)?